What price a pair of lunar wheels? Try $US11.5m. At least, that is if the rover has been ordered by the Canadian Space Agency and you been tasked to tackle the terrain of the Moon and Mars. It's a hefty chunk of GLXP prizemoney, but this $US11.5m rover has no ordinary wheels, either. McGill University mechanical engineering professor Peter Radziszewski and his team plan to base the wheels on a model they're calling the "i-ring". 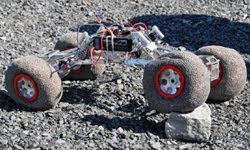 It's a fabric wheel filled with particulate and it's caught the eye of the CSA for its ability to help rovers climb obstacles larger than their individual wheels. It’s “like a (metal) bean-bag wheel,” Prof Radziszewski told the Star. That also means it can travel at higher speeds than a rubber or pneumatic tyre, which bounce easily, or solid wheels, which can turn a rover over on impact. The "bean-bag" wheels conform with shapes they come into contact with and have superior climbing ability, Prof Radziszewski said.